The main goal of this workshop is to show you how to persist the MasterViewController’s tableView data in a Property List file which resides in the application sandbox’s Documents directory. This mean you’ll have to add code in the AppDelegate class and the AddItemViewController class to make that happen. Add this code in the AppDelegate.h file. You declared a property variable called dataFilePath for holding the full path to a plist file. You declared these methods in the AppDelegate file. This method get the full path to the Documents directory and return it to the caller of the method. The Documents directory exist in the application sandbox. 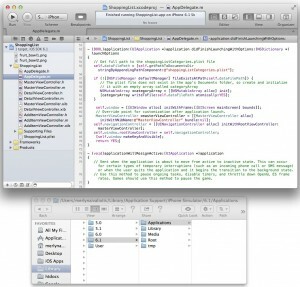 The sandbox is created the very first time you Build and run the ShoppingList project in Xcode. 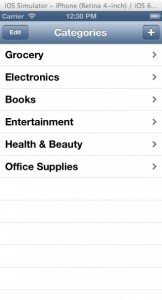 This method add a category name in the shoppingListCategories.plist file. The method takes a single parameter, categoryName and returns nothing. This method fetch all content from the shoppingListCategories.plist file and return it to the caller of this method. The method takes no parameter, but returns a NSMutableArray. This method create a plist file in the application sandbox’s Documents directory. It takes a single parameter, the name of the property list file the method will create in the Documents directory. Switch to the AppDelegate.m file and this code, which implement methods you declared in the interface file. Add this statement in the didFinishLaunchingWithOptions method which basically send a message to the createPlistFile method to create a property list file called, shoppingListCategories.plist in the application’s Documents directory. You are ready to test the didFinishLaunchingWithOptions method’s code, but first I want you to do the follow so you can see the plist file created in the application sandbox’s Documents directory. 1. 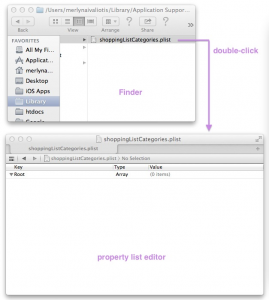 Use Finder to locate the ShoppingList sandbox in the Application directory. If you don’t remember how to do that, then consult this application sandbox post. 2. 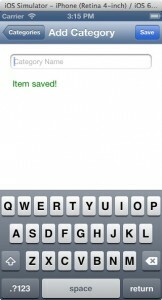 Once you’ve located the ShoppingList sandbox, drag and drop it in the trash can. Why? because we want to start with a fresh copy of the project. 3. 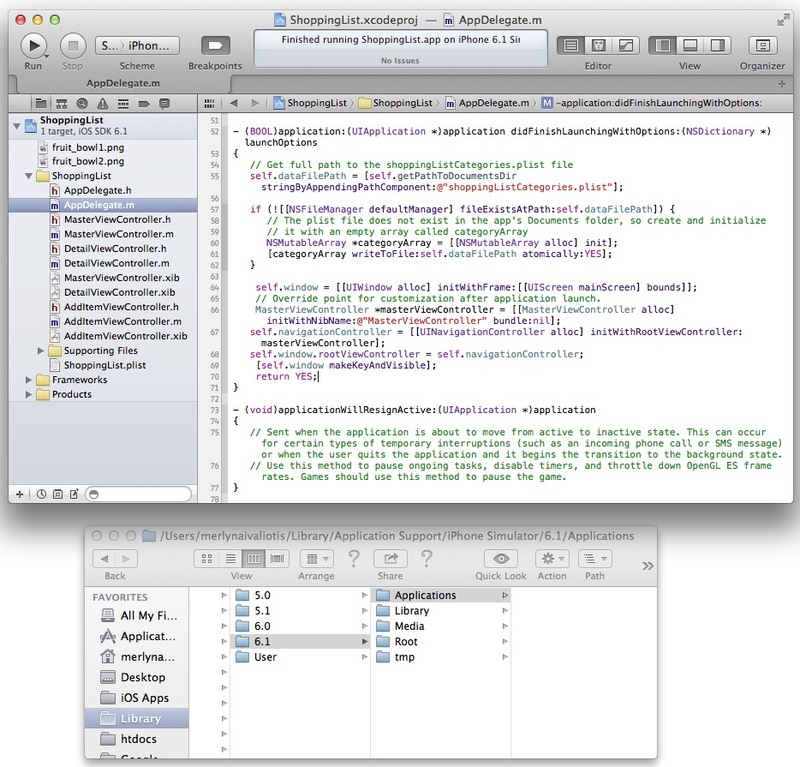 Make sure you can see Xcode’s IDE and Finder on your monitor as shown in this snap shot. Here are the steps to execute so you can see the ShoppingLit sandbox created in the Applications directory and the plist file created in the sandbox’s Documents directory. 1. Click Xcode’s Run button. As Xcode is building the application, keep your eye on Finder’s window. In a moment, the application sandbox will appear in the Applications directory. Once it does, click it to expand it. Finder should look like this now. 2. 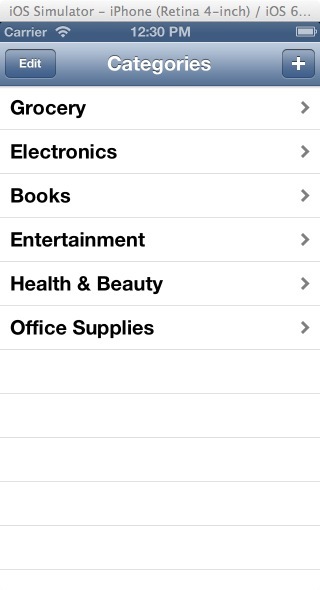 Click the Documents directory and you will see the shoppingListCategories.plist file listed there. 3. Double-click the file to open it in Xcode’s property list editor. As you can see, the plist file contain a single entry called Root which is of Type Array and it is empty. This statement of the createPlistFile method is responsible for creating the Root array you see in the plist file. The shoppingList.plist file is created in the application’s Documents directory, so go ahead and delete the ShoppingList.plist file you see in the project navigator panel. What you need to do now is add code in the MasterViewController class to perform these tasks. Use the fetchShoppingListCategories method in the viewDidLoad method to fetch all data from the plist file and place them the tableDataSource object. Configure the view’s tableView control to display elements of the tableDataSource object. 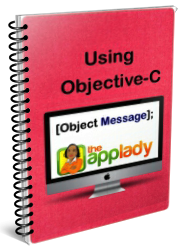 Switch to the MasterViewController.m file and import the AppDelegate class. Next, change the viewDidLoad method’s code to what’s shown below. Next, modify the tableView cellForRowAtIndexPath: method to what’s shown below. If you were to run the application now, you’ll see an empty table, that’s because the tableDataSource object is current empty. update the saveItem method’s code to save the category name the operator entered in the textField control to the plist. Click the AddItemViewController.m file and code shown below, which modify the navigation bar’s title attribute. Next, update the saveItem method’s code to what’s shown below. It is time to test the AddItemViewController class code. 1. Use Finder to locate the ShoppingListCategories.plist file and double-click it to open it in the property list editor. 2. Now, launch the ShoppingList app in Xcode. 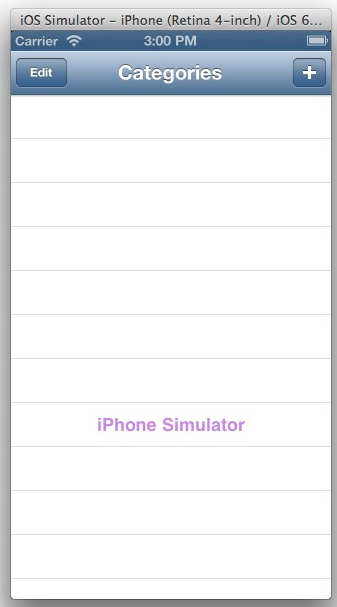 The MasterViewController’s view is loaded in the iPhone Simulator window and it should look like this. 3. Click the navigation bar’s + button to load the AddItemViewController’s view in the Simulator. Use it to add these category names in tableDataSource array and the property list file. 3. Now, click the navigation bar’s Categories button to return to the MasterViewController’s view. The tableView control should now look like this. 4. Take a look at the property list editor, it should look like this now. Now to see if the tableView’s data is being persisted, terminate then relaunch the application. See, the category names appear again in the MasterView’Controller’s tableView control. By the way, if you were to modify, delete, or add an item in the plist file via the property list editor, it will be reflected in the MasterViewController’s tableView control, the next time you launch the ShoppingList application.